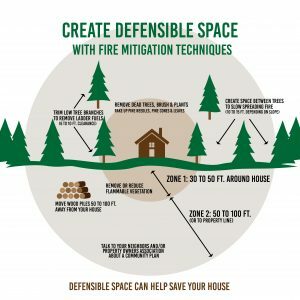 What is Defensible Space? It is a buffer around your home, outbuildings, etc. that has been mitigated to reduce the potential to spread a wildfire. Defensible space, being firewise, improves the chance your home and neighborhood can be saved from a wildfire. By cleaning up and maintaining your property, removing ladder fuels, and other combustible objects, a fire can be slowed or even stopped before it spreads to your home. Defensible Space also helps protect firefighters and provides them a place to work. Creating defensible space around homes is a critical aspect of protecting mountain communities. These workshops provide training educational and training opportunities for homeowners and community groups to learn to evaluate and improve wildfire risk on individual properties and common spaces, and build and maintain neighborhood wildfire risk reduction plans and projects. Below are links to download materials that are available at the El Paso County Office of Emergency Management booth during these dates.